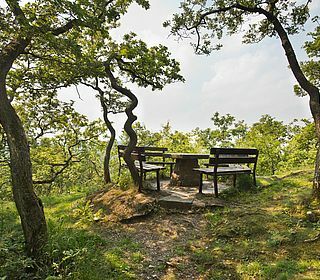 The quality route of the AhrSteig is 100 kilometres of hiker’s paradise. The AhrSteig is divided into seven legs which can be mixed or combined and shortened or extended at your heart’s desire. In the tour planner, detailed path descriptions and other helpful information such as altitude, average hiking time, difficulty and ascent and descent. 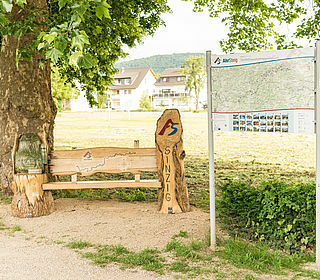 Useful functions such as GPS-Track-Download or the option to print out all information on an entire leg, make planning your AhrSteig trip very easy. 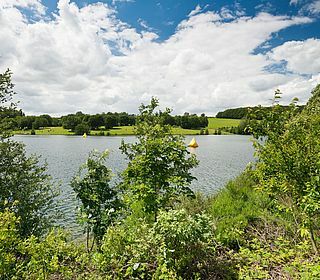 In Stage 1 you can explore a wealth of natural landmarks and cultural treasures between the Ahr source and Freilinger lake. Stage 2 will have hikers’ hearts beating faster with its unique panorama views and sights. Stage 3 includes the castle ruins of Arenberg at 623m- the highest point of the AhrSteig. 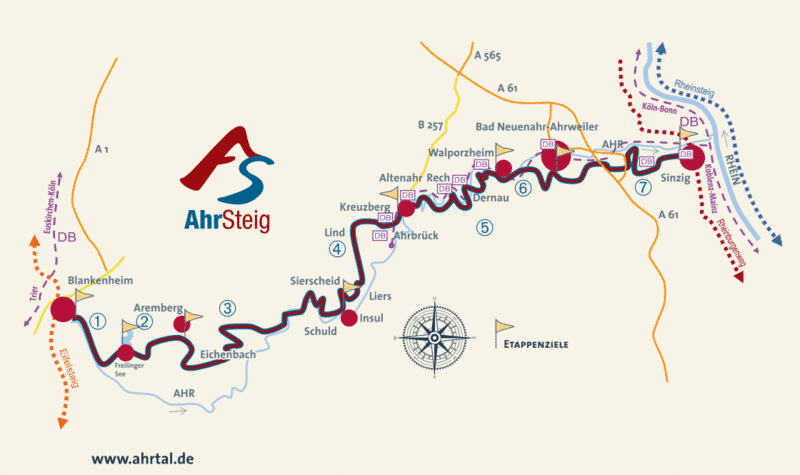 The last leg of the AhrSteig blue, Stage 4, will impress you with its views over the forests of the Ahr mountain range and leads you to just short of Altenahr where the wine growing region of the Ahr begins. Stage 5 connects the west and east part of the journey. Narrow paths lead from Kreuzberg to Walporzheim and are studded with spectacular views at Kreuzberg castle, at the Teufelsloch and the Krausberg tower. 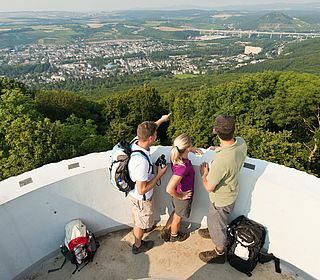 The AhrSteig takes you from the wine village Walporzheim, past Ahrweiler, through the spa town of Bad Neuenahr to Sinzig castle. Stage 6 includes picturesque vineyards, the fairy tale Calvarienberg Abby and the Lourdes Chapel. Stage 7 has more fantastic views of the Ahr valley to offer before reaching the finishing line of the AhrSteig at Sinzig castle. 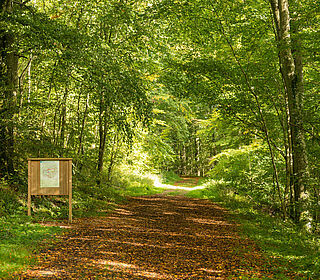 Following the marked path leads you to the nature reserve of the Ahr estuary. The trip is studded with places where you will be welcomes by quality hosts. Find special hiking offers here besides all the information in the Tourplanner. You can buy handy hiking guides and maps as well as further AhrSteig products in the Online-Shop . Be impressed by nature monuments. Let your hiking heart beat faster. Spectacular footpaths and ruddged rocks are breathtaking. 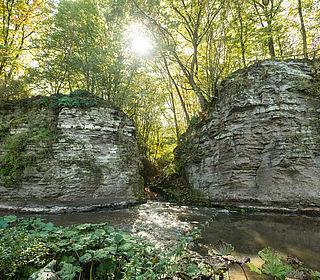 "Rocks, castles, water and wine"- fantastic views on natural ways. Redwinelover will love the sixth stage to taste the brilliant ahrwine. Enjoyable hiking with great views.